Localised areas of the Central Nervous System with function. The current paradigm concerning motivation holds that motivation interpretations of human behaviour can be made at multiple levels, that include local neurological, cognitive, cognitive-social, cultural processes and from an evolutionary perspective. On the basis of neurological activity in brain structures that are monitored during motivational or emotional experience and with associated cognition an arguable classification of brain activity has been mde in terms of Approach, Avoidance and Arousal orientations. These orientations do fit in with drive theories and ultimately an evolutionary origin but proximately describe 3 observable clusters of neurological activity, the Approach orientation can be conceptualised as describing "Interest, engagement and affirmation", the Avoidance orientation describes "To avoid, fear, unpleasant, inhibition" and the Arousal orientation is to do with waking and attention, and is associated with the reticular formation. The reticular formation is significantly associated with waking, it is part of the spinal cord and has ascending nerves into the cortex and descending nerves from the cortex that regulate muscle tonus. 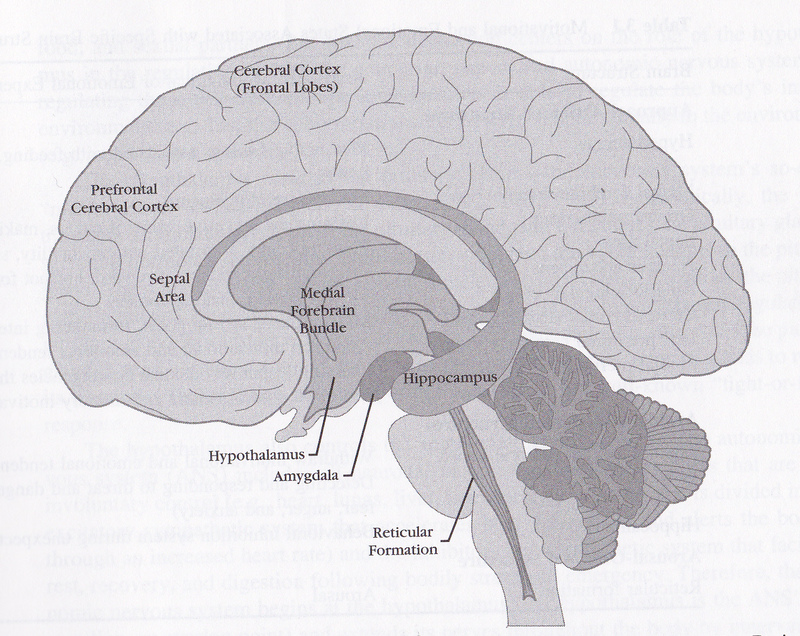 Hypothalamus associated with pleasureable feelings to do with feeding, drinking and mating. Medial forebrain bundle associated with pleasure and reinforcement. Nucelus accumbens associated with the experience of reward (dopamine) and “liking things”. Anterior cingulate cortex associated with mood, volition and making choices. The hypothalamus controls the sympathetic and parasympathetic autonomic nervous system and the pituary gland, which means it is involved in the regulaton of the endocrine system, it regulates the anterior pituary gland through releasing hormones and secretes AVP and oxytocin stored in the posterior pituary gland. The pituary gland regulates the endocrine system and plasma osmolality (Gaw et al 2003 : 73). The anterior pituary gland produces Adrenocorticotropic hormone, Follicle Stimulating hormone, Growth Hormone, Lutenizing Hormone and Thyroid Stimulating Hormone which act on other tissues and are involved in feedback cycles. Adrenocorticotropic hormone is significant in this discussion because it acts on the Adrenal cortex to regulate cortisol and stimulates the production of adrenaline precursors. The sympathetic systemic via spanchnic nerves to the adrenal medulla stimulates the release of adrenaline a non selective agonist on andrenogenic receptors. The Hypothalamus produces arginine vasopressin and oxytocin which is passed along axonal nerve fibers to the pituary stalk of the posterior pituary gland and are stored as granules. Secretion of arginine vasopressin regulates plasma osmolality, is released with severe blood volume depletion via cardiac baroreceptors and in situations of stress and nausea. Oxytocin is released in response to suckling and uterine contraction (Gaw et al 2003 : 76). Therefore the Hypothalamus's role in approach responses appears to be arousal through the sympathetic nervous system and relaxation throught the parasympthatic nervous system and regulation through endocrine control. The medial forebrain bundle is a collection of pathway like fibers that connects the hypothalamus to other limbic structures, including the septal area, mammillary bodies and the ventral tegmental area. It is described as being heavily involved in reinforcement, a "pleasure center", in humans it seems to be associated with positive feelings. The Amygdala is a collection of interconnected nuclei associated with emotion and motivation, such as fear, anger and anxiety and is involved in the perception of other peoples emotions, reading facial expressions and awareness of our own moods (positive or negative affect different from emotions). It is involved in the role of learning new emotional associations, such as learning to feel fear in situations that potentially involve harm. It sends projections to many areas of the brain, significantly in the direction of away from the Amygdala to other regions and it has been hypothesized that this is why emotion tends to overpower cognition, significantly negative emotions. The septo-hippocampal circuit involves the integrated action of several limbic structures including the septal area, nucleus accumbens, hippocampus, cingulate gyrus, fornix, thalamus, hypothalamus and mammillary bodies. It includes cereberal cortex interconnections thus a significant amount of cognitive activity from memory and imagination are input into the circuit, thus the septo-hippocampal circuit forecasts emotion with upcoming events, pleasure and anxiety. The nucleus accumbens is involved in deriving pleasure from naturally reoccuring reinforcement, such as good food and social acceptance, relational needs and also addictive drugs. It is involved in liking certain types of food. The hippocampus constantly compares incoming sensory information with expected events from memory, if everything happens as expected (things are ok), then it does not generate signals from the septo-hippocampal circuit to produce anxiety. When the unexpected does not occur the septo-hippocampal ciruit sends out signals to produce an anxious high arousal state. Anti-anxiety drugs such as alcohol and barbiturates quieten the septo-hippocampal effect. Dissapointment, failure and punishment, because they involve the generation of unexpected events or at least counterfactual thinking, generate anxiety ridden behavioral inhibition (things are not ok). Coping attempts to deal with environmental stressors, when successful, generate the release of endorphins, which shuts down the septo-hippocampal circuit, generating anxiety releif and positive counter feelings. The anterior cingulate cortex is associated with the processes of day to day mood control (positive & negative affect), volition and making choices. Sadness and depression is associated with decreased activity in the anterior cingulate cortex, mental activity and choice making is associated with an increased blood flow. The reticular formation is involved in arousal and the process of awakening the brains motivational and emotional engagement. The antomy of this area of the upper spinal cord, which goes into the medulla and pons, consists of the ascending reticular activating system, which has nerves in the brain to arouse the cortex and the descending reticular formation to regulate muscle tonus. Thus it is involved in regulating peoples behaviour when asleep. It is involved in pain modulation and damage to the reticular formation can induce permanent coma. At the very least,the cerebral cortex has left right distinctions and a medial, temporal and occiptal distinctions. The frontal cortex is associated with peoples conscious goals, that are routinely opposing, involve multiple factors and can be high order, such as those described in McClellands Needs theory or Murrays Psychogenic Needs. Thoughts that stimulate the right prefrontal cortex generate negative and avoidance -orientated feelings, whereas thoughts that stimulate the left prefrontal cortex generate positive and approach-oriented feelings. Basic personality differences exist between people as some people have especially sensitive right prefrontal lobes that tend to make them vulnerable to negative emotionality, while others have especially sensitive left prefrontal lobes that leave them vulnerable to positive emotionality. Positive emotionality is not necessarily the advantage it might seem, in social psychology being in a good mood is associated with an increased willingness to help others, which means they are more susceptible to social influence. People in a good mood are more likely to use heuristic thinking and increased reliance on general knowledge with availablility heuristics (Baron, Byrne & Branscombe 2006 : 71). This leaves me with questions on the significance of handidness and the significance of language and spatial awareness left-right hemispherical orientation of the cerebral cortex. I will edit this as find answers, this is heavily from Reeve 2009. Baron, RA: Byrne R. & Branscombe, N.R. (2006). Social cognition, Chapter 2 in Social psychology, (11th Edition). Published by Boston: Pearson. Page 71. Gaw, Allan : Cowan, Robert: O'Reilly, Denis; Stewart, Michael & Shepherd, James. (2003). Clinical Biochemistry. (2nd Edition). Published by Churchill & Livingstone. Pages 73 to 94. Reeve, Johnmarshall. (2009). Understanding Motivation and Emotion. Published by John Wiley & Sons. Pages 47- 74.